Scientific American : Uncommon Time: What Makes Dave Brubeck's Unorthodox Jazz Stylings So Appealing? Brubeck's music doesn't swing the way jazz "should," but it combines novelty and familiarity in a way that stimulates the brain. Jazz legend Dave Brubeck died December 5, just one day before his 92nd birthday. The pianist and composer was an innovator, especially when it came to combining rhythms and meters in new ways. "He sort of tired of the traditional patterns of jazz," says Patrick Langham, a saxophonist and faculty member of the Brubeck Institute at the University of the Pacific in Stockton, California. 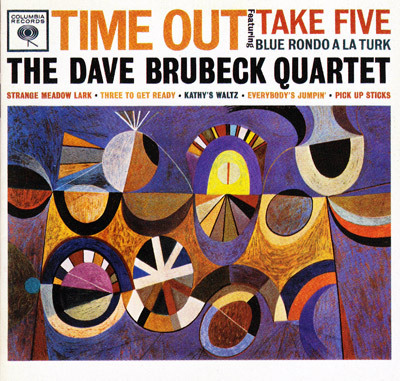 Time Out, the hit 1959 album by the Dave Brubeck Quartet, was one of the first popular jazz works to explore meters beyond the traditional 4/4 and 3/4. (The first number, which is the top number of the time signature in sheet music, represents the number of beats in the measure, and the second number represents the note value that receives one beat. 4/4 means that there are four beats and a quarter note lasts for one beat, yielding four quarter notes in each measure.) 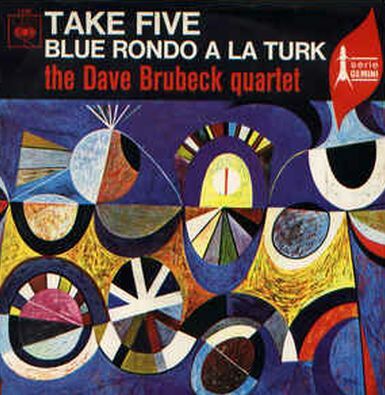 "Take Five" and "Blue Rondo a la Turk," two of Brubeck's most popular works, are both on Time Out. "Take Five," which was conceived by Brubeck's saxophonist Paul Desmond, is in 5/4 with the accent pattern one two three four five, so each measure can be thought of as being split into two uneven chunks. Langham says that from a dance point of view, the meter of "Take Five" combines a waltz and a two-step, both of which were popular in the 1950s and 1960s with the parents of teenagers. "This allowed college students to be different, in the sense of adding a funky twist to it." "Blue Rondo a la Turk" has a time signature of 9/8. In 9/8 time, the nine eighth notes are usually divided into three groups of three, with the stress pattern one two three one two three one two three, but "Blue Rondo" has the pattern one two one two one two one two three. It even gets a bit more complicated: for most of the piece, there are three measures of the unusual 9/8 rhythm followed by one measure of the usual groups of three. Of course, novelty is in the ear of the beholder. Langham says that Brubeck "was a very worldly person. Within his travels he would go and hear other musicians and hear what they were doing, and he would incorporate that into his music." In the case of "Blue Rondo a la Turk," Brubeck picked up the rhythm from street musicians in Turkey. "It seemed very natural to them to be playing in this rhythm," Langham says. Justin London is a professor of music at Carleton College in Minnesota who specializes in music perception and cognition, particularly with respect to musical meter. He says that Brubeck actually inspired much of his research into rhythm and meter. "I knew that it had a visceral, toe-tapping sense of beat and rhythm," he says, "but according to most theories of rhythm and meter developed in recent decades, it couldn't, given its uneven beat structure." "These uneven meters play by slightly different rules than the symmetrical meters," London says. For one, people's brains can't process the unusual meters as quickly as the standard ones, so they can't be performed as quickly. "Uneven beats are perfectly fine, but we can't do it quite as fast as with even beats." They also can't "swing" the way a lot of jazz does. When a piece swings, two eighth notes in succession aren't played evenly; instead, the first is longer than the second. This can make the figure sound like a triplet (with the first two notes slurred together) instead of two eighth notes. "When you're swinging, you're very close to blurring the lines between duplets and triplets," London says. But "Blue Rondo a la Turk," which relies on the listener hearing sets of both two and three, would get too muddy if it started to swing. "Brubeck was criticized for not swinging, but you can't swing the music in those meters the same way you can if you're just in a straight four." London says that Brubeck's rhythms can play with the listener's innate toe-tapping ability—the technical term is entrainment. "Whenever you start doing anything in rhythm the whole motor center of the brain starts lighting up." He notes that musicians and nonmusicians do equally well on tests of this ability. It appears to be an innate skill, part of the way we interact socially. Asymmetrical meters may be appealing because they test people's native entrainment ability and keep the brain more active while listening and performing. "The asymmetrical meters do make you work a little harder to make you stay along with them, and that's part of their appeal, attraction and charm," London says. "Although it's written in 5/4," London says about "Take Five," "the pianist is often playing groups of 3+3+2+2 [eighth notes], so it's actually two long beats and two short beats." This gives the music an off-kilter feel. He adds that in "Blue Rondo a la Turk," the last measure of each phrase, with its three sets of three eighth notes, can sound off-balance after the first three measures. "The uneven makes the even sound syncopated." David Huron, a music professor at The Ohio State University, researches a variety of topics in music cognition, including the emotional effects of music and what makes tunes memorable. He says that musicologists tend to focus on novelty when discussing musical appeal, but in reality, "people prefer things that are familiar." He says that in order to make songs such as "Take Five" and "Blue Rondo a la Turk" compelling, Brubeck had to balance the novelty of the rhythm with familiarity, particularly through repetition. "If you want to make things accessible to listeners, repetition is key. If he had just done a more Stravinsky-esque thing, playing around with these rhythms and not repeating them, then what we know from the research is that would be much less appealing to the listeners." For the performer, unusual rhythms can be a challenge. "They feel very natural to me," Langham says, "but I grew up listening to Dave's music!" Joking aside, he says that the odd time signatures "don't allow you to play the normal riffs and ideas that you're so used to and comfortable doing when you're playing in a standard time signature." He says that this disruption of the status quo can help musicians grow. London says that in order for the ensemble to synchronize in difficult meters, they have to use different strategies from what they usually do. They need to be more aware of the larger measure-to-measure structure of the piece, rather than just the shorter sections of the work. Brubeck wasn't too caught up in the psychology or numerology of his music. "Of course, rhythms can be looked at in a mathematical kind of way," Langham says, "but I think as a musician he was more focused on making sure that the music reflected a type of emotional content, that it was able to reach people and move people, even if it wasn't in a standard time signature like 4/4." On a personal level Langham says that he feels blessed to have known Brubeck. He met the composer shortly after being hired by the Brubeck Institute in 2003. Langham had been invited to the home of the Institute's dean for dinner, and Brubeck and his wife were there, too. "Here I am sitting having dinner with Dave and Iola Brubeck, and I've only been on campus a week," he says. Brubeck and Langham saw each other at least twice a year at different events and, he adds, "every year no matter what, I got a Christmas card with a handwritten note from Dave." Although Brubeck was quite elderly, he was in relatively good health up until the end, and his death was unexpected. "It's been a tough time dealing with the passing of Dave," Langham says. "I'm honored that he's left us such a legacy."